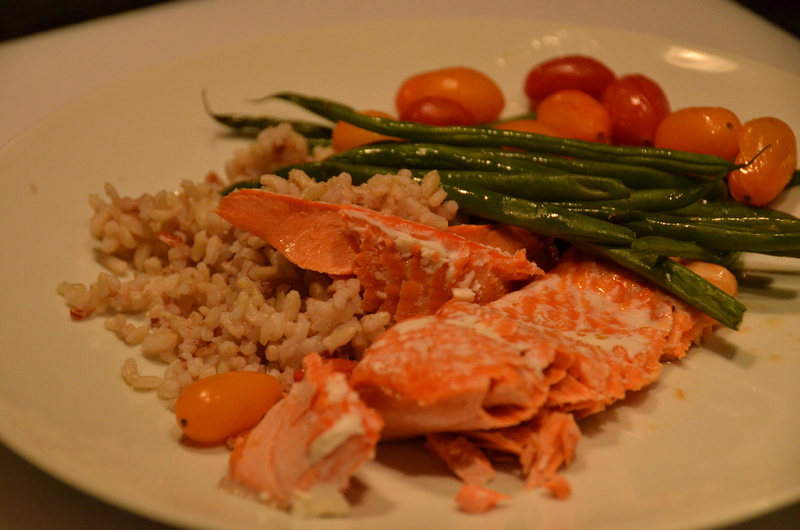 This simple salmon dinner was influenced from The Naked Chef: Jamie Oliver. Back in 2000, my husband brought this cookbook home. We mostly ate at restaurants in those days, and having read about the simplicity of Jamie’s recipes was appealing. At the time, my husband said, “If you can read and follow instructions, then you can make a great meal with this book.” And he did. He made just about every recipe from this cookbook, without fail. Because there are some ingredients which I am avoiding these days, I have customized this recipe. The following is my variation. It takes very little time to prepare AND is very low cost. I wanted to share this recipe for both of these reasons. Be sure to make extra for leftovers, whether following my version or the original. The original (which is amazing, if you like anchovy and olives – I do, but must not…) is on Page 97 from the above mentioned book. Enough Salmon for two. 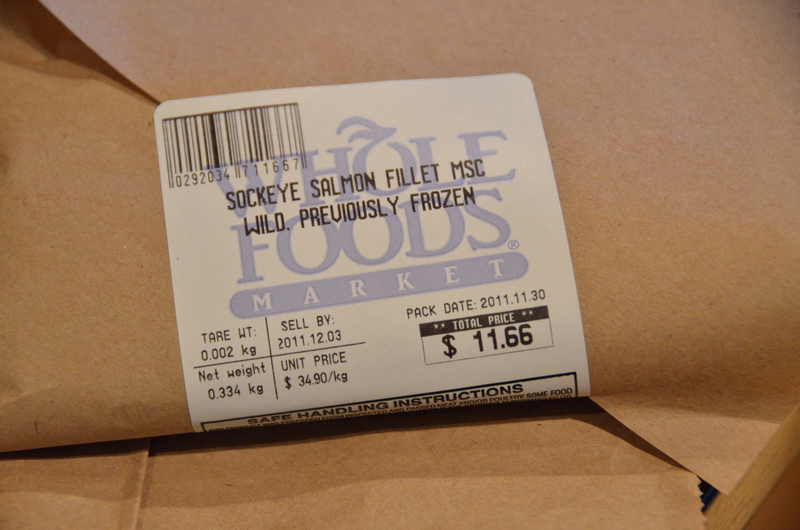 I got just under a pound of Wild (Previously Frozen) Sockeye Salmon. I usually buy half a pound of fish per person, in our case I knew just the two adults would be eating this. Today the fishmonger cut a bit less than the pound I asked for, and I didn’t want to wait around for another cut. In hindsight, I should have gotten two pounds…there are no leftovers. 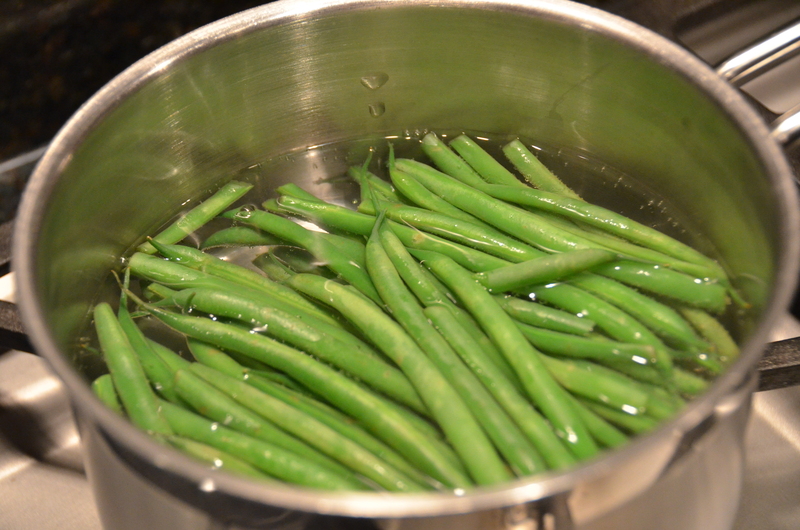 French Green Beans just added to a pot of boiling water. 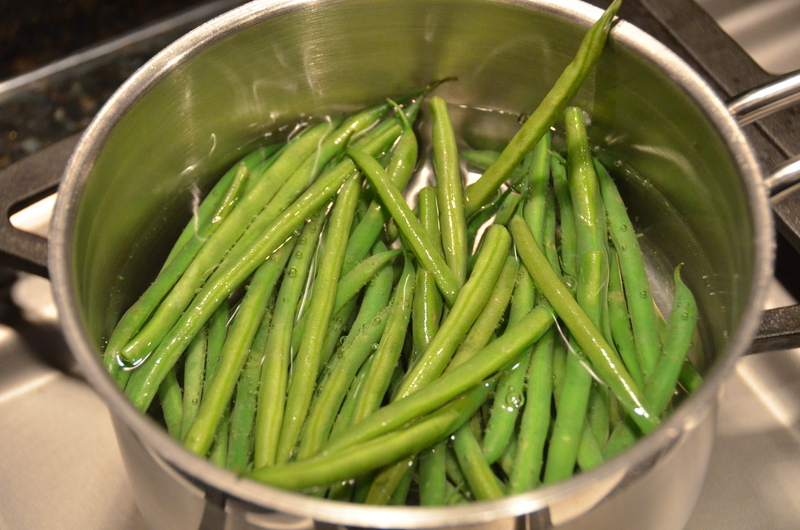 Green Beans after being Blanched. Boiled for just one minute. Then drained. 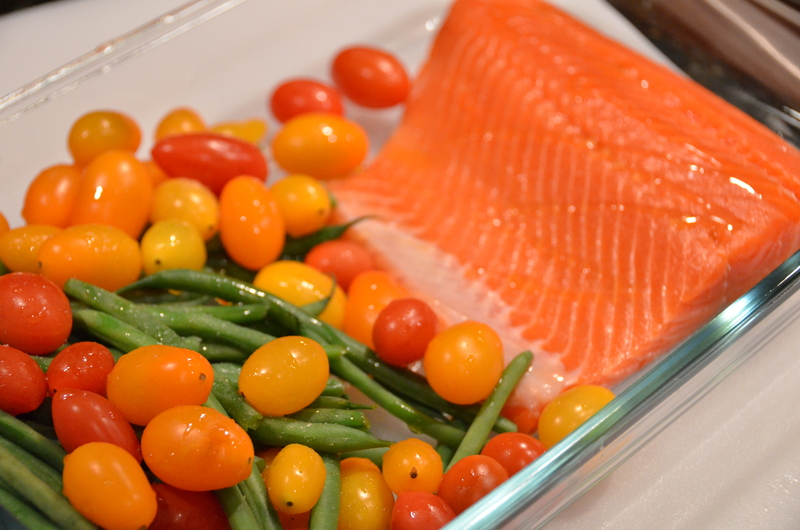 Place Salmon (which has been rinsed with water and patted dry with paper towel) on to the dish. 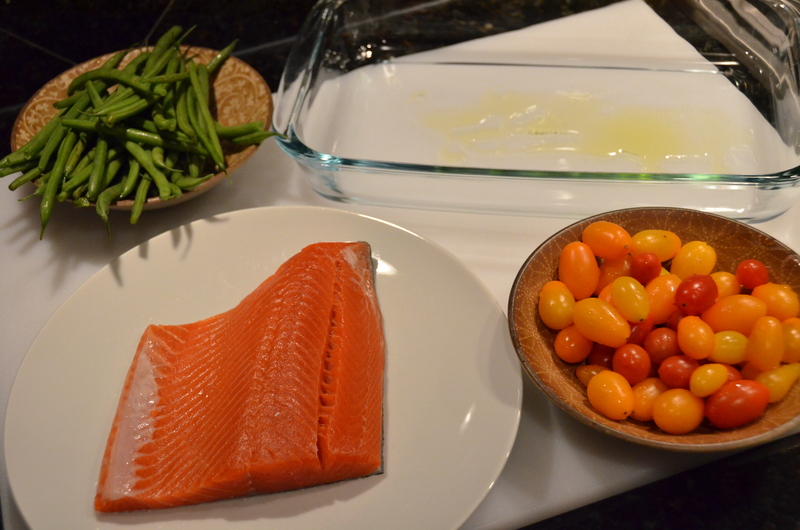 Scatter drained -Blanched Green Beans and raw tomatoes to the other end away from the fish. 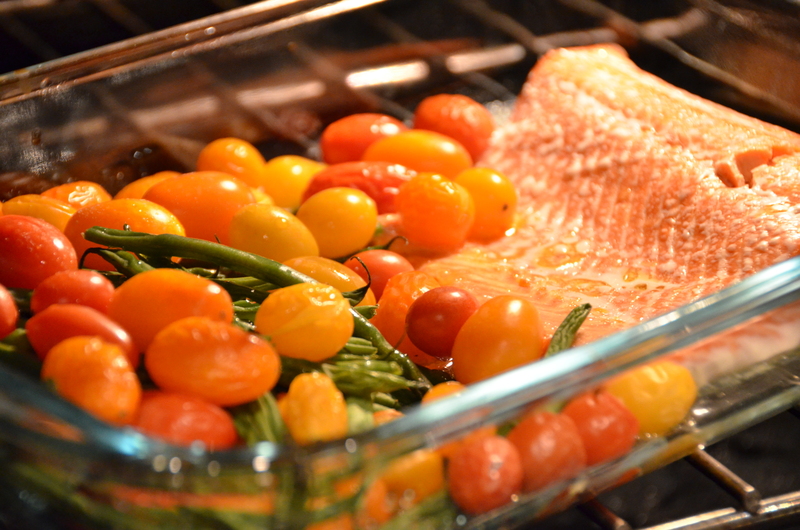 Drizzle the Olive Oil over the vegetables and just a little over the Salmon. Sprinkle ground Sea Salt over the entire dish. 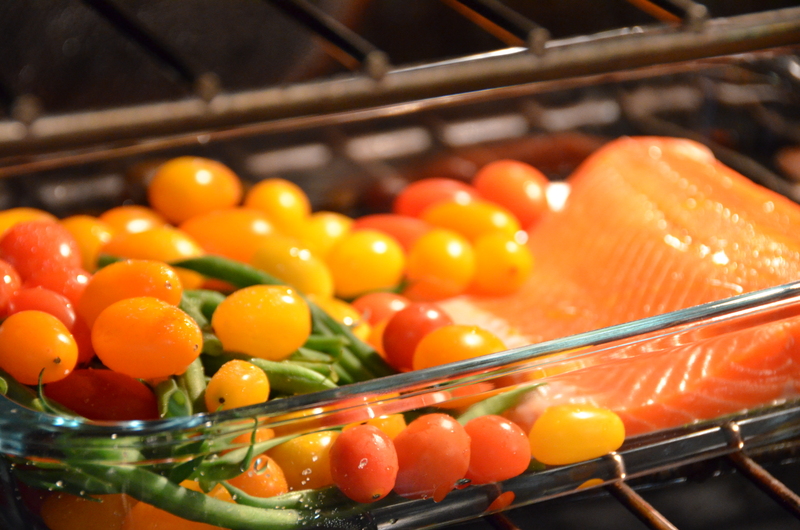 Place in a preheated oven (350 degrees) for 10 minutes, or so depending on your oven. This is what it looks like cooked. I know this isn’t the best picture, but just wanted to show my portion. Served with a mixture of Brown and Red Rice – that I had never tried before (conveniently made the day before), called Volcano Rice. And it only takes 30 minutes to cook, as opposed to the usual 50 minutes for regular brown Basamati, which is what I usually make. I love this kind of meal. With basic ingredients, it is inexpensive, simple and quick to prepare. No excuses for not eating healthy fare. Let me know if you try this recipe and how you customize it to suit your taste!